COMSOL Multiphysics® software is one of the most valuable software modeling tools for engineers and scientists. This book is designed for engineers from the fields of mechanical, electrical, and civil disciplines, and introduces multiphysics modeling techniques and examples accompanied by practical applications using COMSOL 4.x. 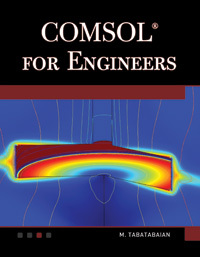 The main objective is to introduce readers to use COMSOL as an engineering tool for modeling by solving examples that could become a guide for modeling similar or more complicated problems. The objective is to provide a collection of examples and modeling guidelines through which readers can build their own models. Readers are assumed to be familiar with the principles of numerical modeling and the finite element method (FEM). The book takes a flexible-level approach for presenting the materials along with using practical examples. The mathematical fundamentals, engineering principles, and design criteria are presented as integral parts of examples. At the end of each chapter are references that contain more in-depth physics, technical information, and data; these are referred to throughout the book and used in the examples. COMSOL for Engineers could be used to complement another text that provides background training in engineering computations and methods. Examples provided in this book should be considered as “lessons” for which background physics could be explained in more detail. 1: Introduction. 2: Finite Element Method (FEM). 3: COMSOL - A Modeling Tool For Engineers. 4:COMSOL Models for Physical Systems. Appendices. Index. Mehrzad Tabatabaian holds a PhD from McGill University and is currently the chairman of the Energy Efficiency and Renewable Energy Division at the British Columbia Institute of Technology. He has written numerous journal articles, has registered patents, and currently teaches courses in renewable energy and thermal engineering.